Despite telling us that Khal Drogo is riding in the Horse God’s starry khalasar, never to return to the great grasslands of Essos, Jason Momoa has revived the character and he’s a lot funnier now. 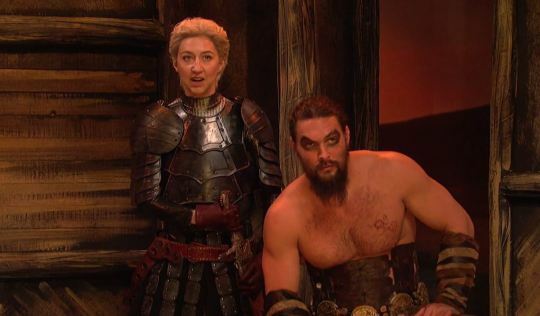 Momoa brought back his iconic Game of Thrones character one last time for Saturday Night Live but it seems Drogo’s had a career change in the afterlife. Khal Drogo, the Great Rider, has now got his own talk show on the ‘Dothraki Public Access channel’ where he talks to other Thrones‘ characters who’ve met a grisly end. Not going to lie finding work as a talk show host is a strange career choice for a man who says like 10 words across the whole of the first season and enjoys indiscriminate slaughter, but who are we to judge. In the sketch, Drogo meets up with some of the show’s greatest bastards (sometimes literal bastards) The High Sparrow, Joffrey Lannister Baratheon and the Queen of Thorns, Olenna Tyrell. The sketch isn’t just for Thrones fanatics though, it also throws some real shade at Kevin Hart and his recent Twitter debacle which saw him lose his job as the Oscars host. It’s Brienne of Tarth who delivers Drogo a ‘teachable’ moment when he presumes she’s a man and she shuts the Khal telling him he ‘has a lot to learn about identity politics’. You’re right, Khal need to learn from Khal’s mistake, or Khal never win Oscar – or get to host Oscar. Only last week Jason devastated fans when he said that Khal Drogo will never return, joking ‘it’s been nine years, just let him go’. He went on to add that the only reason Drogo was killed so early was that otherwise the whole of Game of Thrones would be wrapped up in two seasons with Drogo presumably murdering the whole cast. Worry not Thrones fans it’s not all bad news. 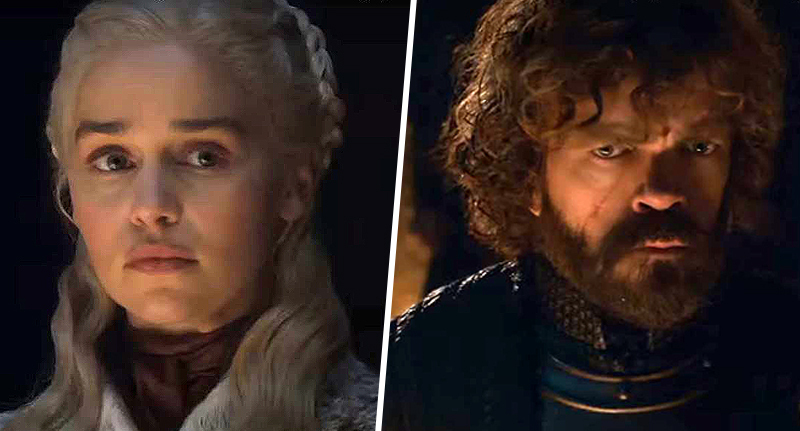 HBO have finally released the first teaser for the upcoming final season of Game of Thrones. The Ice and Fire teaser appears to show frost slowly spreading over a map of Westeros, consuming wooden representations of a dragon and a dire wolf, the symbols of the Targaryen and Stark houses. Eventually, the frost reaches the south of the map but before it can cover a lion the south of the map explodes in flames fighting back the frost in a literal war of ice and fire which eventually forms what appears to be a dragon glass barrier. Fans have already started speculating as to what the trailer might be trying to say? Will the Starks in Winterfell and their Targaryen allies fall to the White Walkers and their legion of wights? Will the Lannisters win the day and end up cementing their grip on the Iron Throne? Or is the whole thing a misdirect and Hot Pie will take his rightful place as King of the Seven Kingdoms. Game of Thrones will return to TV in April 2019.